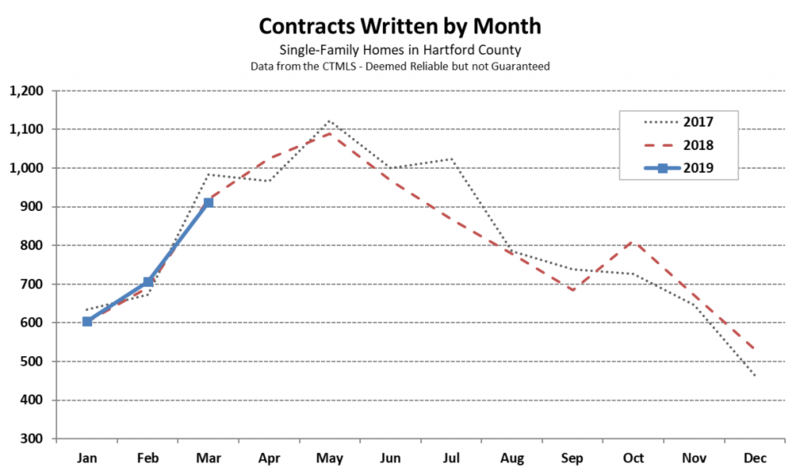 Hartford County finished March with 911 single-family properties accepting bids. The total was within 1% of the March 2018 total, and on a year-to-date basis the County is about 0.4% ahead of 2018. The first quarter was amazingly similar to last year, which bodes well for the remainder of the year. An important trend so far this spring was the decline in mortgage interest rates. Buyers were getting loans at about 4.5% at the beginning of the year. Now lenders are offering rates that are closer to 4.0%. It’s a modest difference, but one that buyers appreciate. Another trend is that inventory levels continue to be on the low side. Right now there are about 2,149 homes available for buyers, representing 2.7 months of inventory. This is less that the 2,271 properties and 2.8 months of inventory at this point in 2018, and the 2,471 properties and 3.0 months of inventory in 2017. We are entering the most active part of the spring real estate market. This is the time to begin marketing you home if you are interested in selling, and to begin scouting properties if you want to buy a new home. We are happy to help with either – or with both! 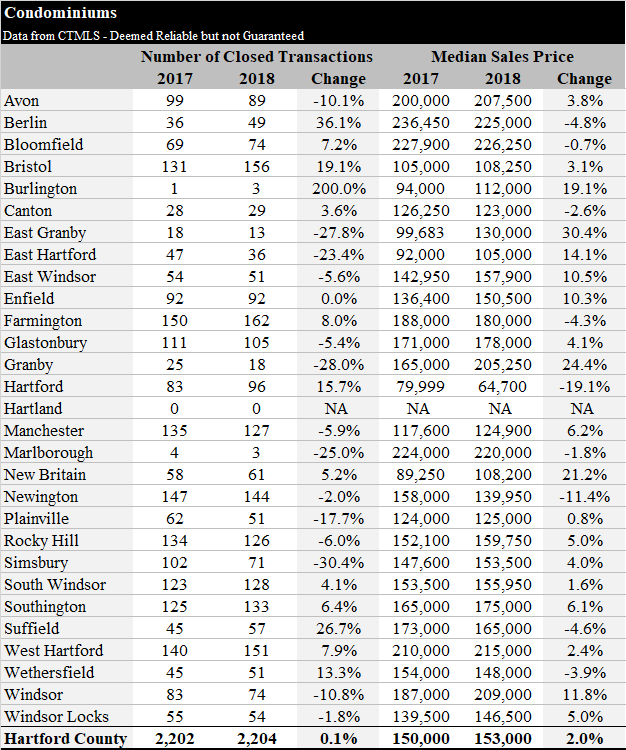 Here are the latest stats for individual towns in Hartford County. 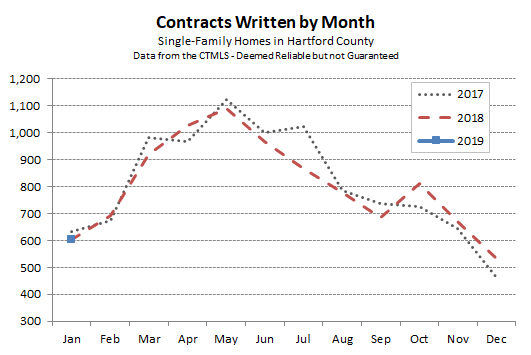 The Hartford County single-family market finished February with 706 contracts, a 2.2% increase over February of last year. The year always begins with a slow ramp up of activity as new listings come onto the market, and buyers begin to think about the spring. 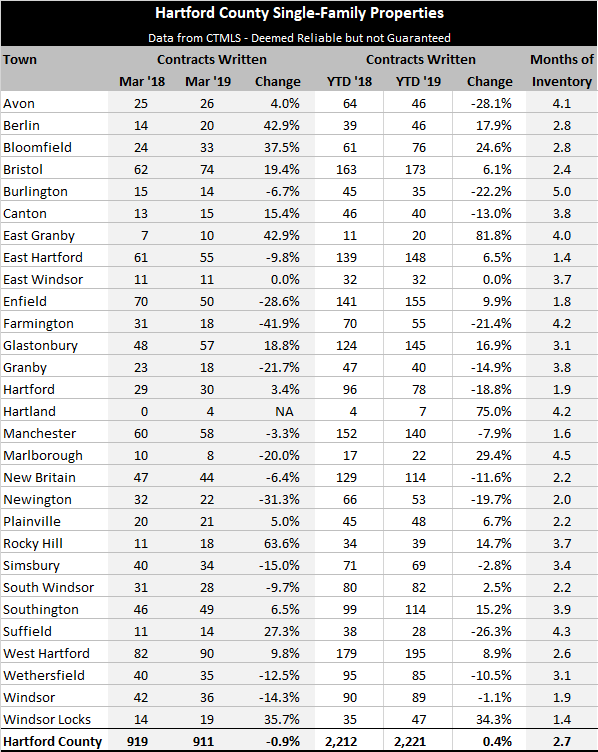 Market data shows that the inventory of available homes is still quite low in many towns. Buyers tend to behave in one of two ways when there are not a lot of properties to choose from. They either aggressively compete for the available properties, or they take a step back to wait for more homes to be listed. It mostly depends on how urgently they need to find a new home. We’re seeing some of each behavior at the moment. This is the time of year to get your home onto the market. Pricing continues to be strong, mortgage interest rates continue to be low, and buyers are focusing more on their home search. Give us a call for an evaluation of your property, we can give you a sense of your specific situation. 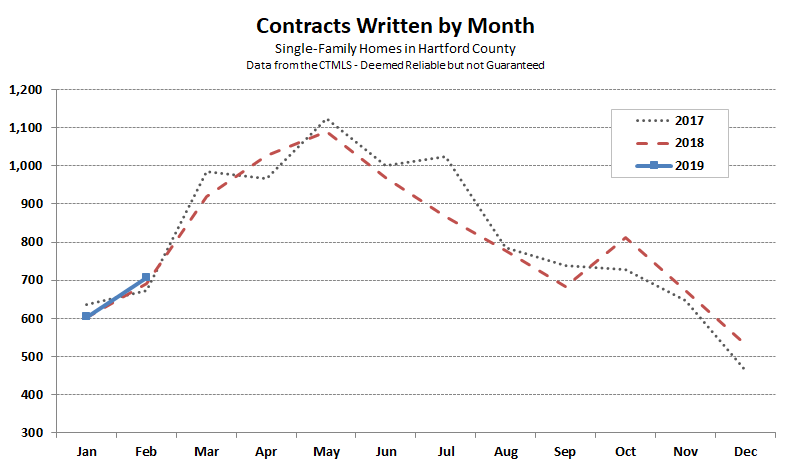 The Hartford County single-family home market opened 2019 with 604 contracts in January. The total matched last January’s deal count almost exactly, and set the stage for another strong year in the real estate market. It is far too early to even consider looking at town-by-town trends in detail. We typically don’t even try to interpret the nuances of the market until after the majority of the spring market rush has passed. 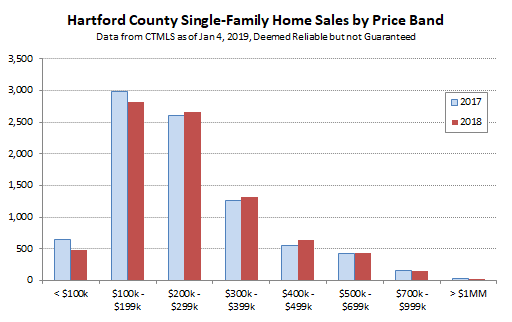 At this point in the year we focus on the County-wide activity level and inventory. I like what I’m seeing in terms of the number of deals. 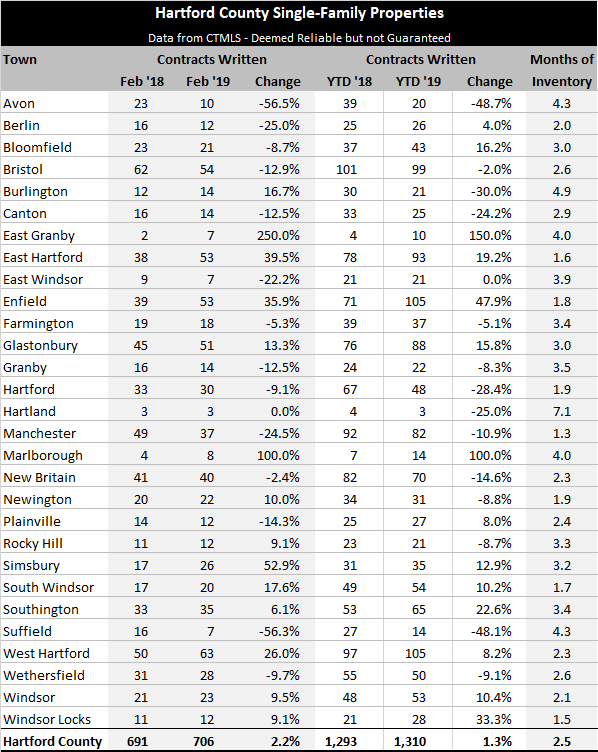 The number of active listings is traditionally quite low at the end of January, so seeing 2.7 months of inventory looks about right (In last year’s report it was 2.6 months). Now is the time to start thinking about your real estate goals for the year. We’re here to help – call Kyle at 860-655-2922 to get started. 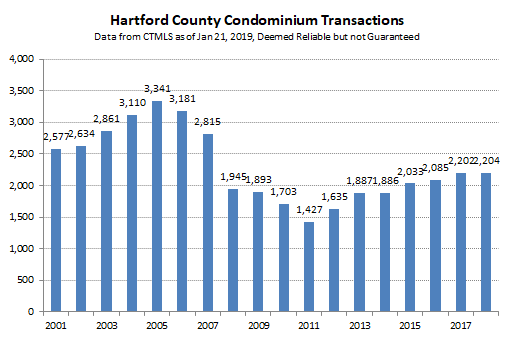 Hartford County condominiums maintained their pace of sales in 2018. The deal count increased by 2 properties from 2017 to finish with a total of 2,204 sales. The median condo sales price increased by 2% from the previous year, reaching $153,000. The positive direction was the first meaningful step upwards for the median price in a decade. 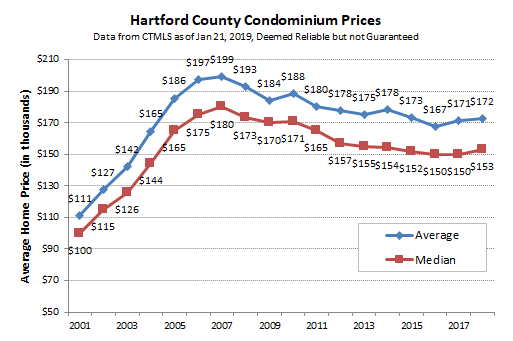 One of the reasons for the long-term downward trend in the median price is that developers have sold fewer “New Construction” condos in the current decade. The chart below shows that there was a wave of new properties built in the previous decade. Those new units, which represented more than 15% of the total number of deals in 2006, played an important role in pushing up the median price. The uptick in median price, and the level deal count, resulted in a reasonably steady distribution of sales by price band. Finally, here is the breakdown of the number of deals and median prices by town. 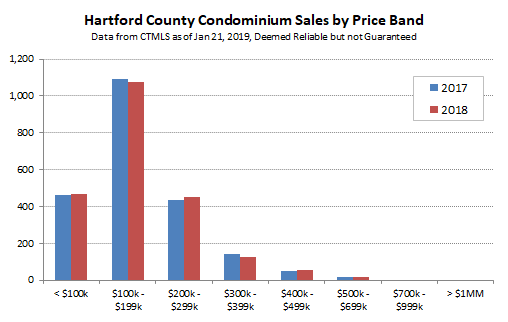 Condominiums are distributed throughout the County, so a number of towns have active condo markets. Don’t hesitate to ask us your condominium questions. We’re experienced agents who are active the local condo market. How can we help you? 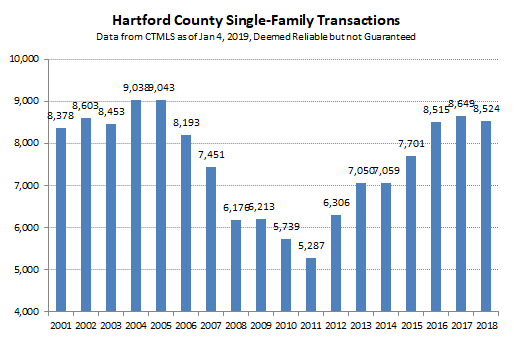 Hartford County finished 2018 with a closed deal count in the mid-8,000s for single-family homes for the third year in a row. Median single-family homes prices increased by 4.5% from $220,000 to $230,000. Average single-family home prices also increased, though by a smaller percentage. Breaking the number of sales down by price band, we can see that number of deals at prices below $200,000 decreased, while the number of deals in the middle price bands increased. All of these observations are positive for the real estate market. 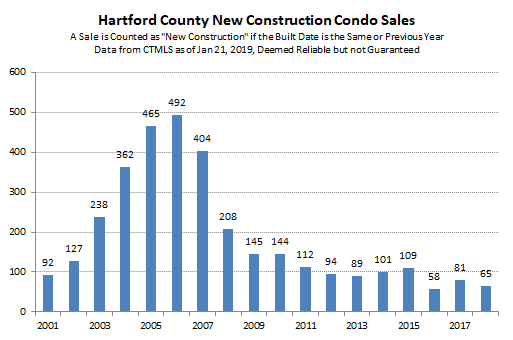 Deal count is holding steady near the high points established in the early 2000s. Prices are rising as measured by both common valuation metrics. The decreasing number of deals at the lower price points are a result of the rising prices – properties moved up into the next price band. Most interesting is that the market is behaving similarly to the first few years of the 2000s. The data shows stable deal count with upward pressure on prices. 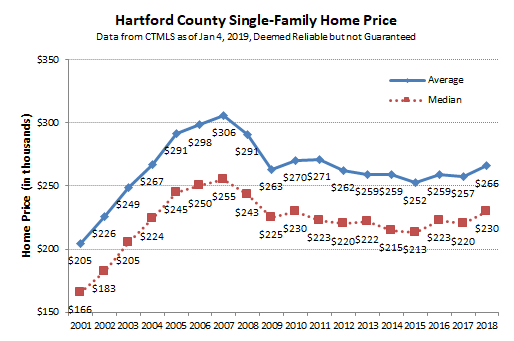 Price increases were driven by strength at the low end of the market, which represents the majority of Greater Hartford’s housing stock. This year’s market checkup shows a healthy real estate market without any significant warning signs.